KOTA BELUD, 25 April 2018 – The Frog Classroom and Frog Hub School at Sekolah Menengah Kebangsaan Agama (SMKA) Tun Said were officially launched today by YB Datuk Seri Dr Salleh Said Keruak, caretaker Minister of Communications and Multimedia Malaysia, who is also the incumbent Member of Parliament for Kota Belud. Present at the launch were Dato’ Yeoh Soo Keng, Executive Director of YTL Communications, Ms Yeoh Pei Lou, Executive Director of FrogAsia Sdn Bhd and Datuk Hajah Maimunah Haji Suhaibul, Sabah State Education Director. 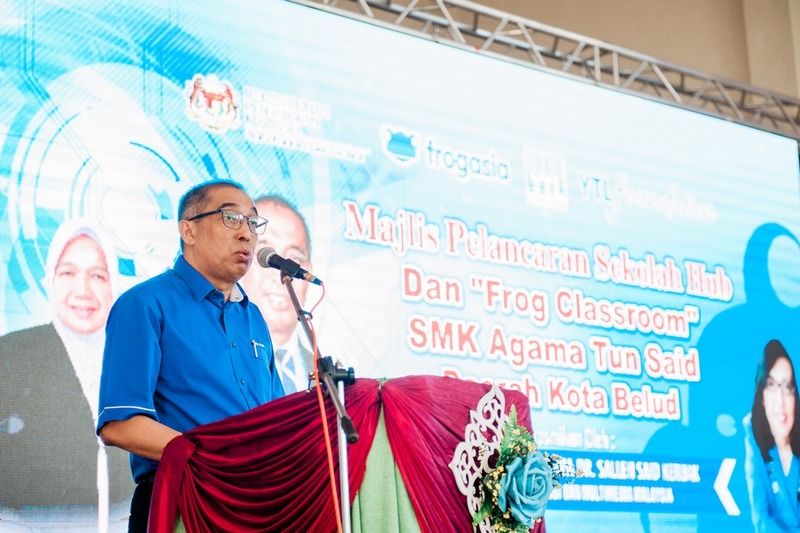 With the launch, SMKA Tun Said, a boarding school that has been actively using the Frog Virtual Learning Environment (Frog VLE) platform for teaching and learning since its launch in 2012, is now equipped with a Frog Classroom to achieve elevated 21st Century teaching and learning outcomes. As a Frog Hub school, SMKA Tun Said will be able to share its facilities and 21st Century teaching skills with the rest of the schools in Kota Belud, continuing its effort as a model school in helping more teachers raise the bar in education. The Frog Classroom in SMKA Tun Said, donated by YTL Foundation in collaboration with FrogAsia and YTL Communications, is part of a programme to transform classrooms throughout Malaysia into 21st Century learning spaces that promote technology-enabled, student-focused learning. Every Frog Classroom is a space for students to learn creatively and also serves as a Frog Hub, a space for teachers in the community to learn and share new classroom experiences. In this school, the Frog Classroom has been equipped with 4G Internet and 41 Chromebook laptops that provide access to the Frog Virtual Learning Environment (Frog VLE) online learning platform. The Frog Classroom is also equipped with the programme’s hallmark curved tables, designed to create more opportunities for peer-led learning and interaction. “We believe in providing Malaysians exposure to the best education possible and equipping Malaysian students to be globally competitive. This is why 21st Century learning spaces that build creativity, collaboration, critical thinking and character is part of what we want to do for all schools in Malaysia,” said Dato’ Yeoh Soo Keng, Executive Director of YTL Communications. She added that technology can level the playing field in everyday learning, and with the Frog Classroom, 21st Century teaching and learning can take place. Yeoh said that YTL is proud to be partners with the government of Malaysia in laying the foundation for 21st Century teaching and learning through the 1BestariNet project. “By connecting all schools nationwide through the Frog VLE, Yes 4G high-speed internet and Chromebooks, students have access to information far beyond the physical limits of the classroom. Students also have the opportunity to connect, learn and collaborate with students from schools in other locations via the Frog VLE.” She added that the World Economic Forum (WEF) Global Competitive Report 2017-2018 ranked Malaysia 27 out of 137 countries for the quality of internet access in schools, ahead of countries like Japan, Germany, Portugal, France, Spain, China, Belgium, Italy, Thailand and Indonesia. Meanwhile, YB Datuk Seri Dr Salleh Said Keruak, Minister of Communications and Multimedia Malaysia thanked the YTL Foundation for empowering SMKA Tun Said with the Frog Classroom. “I am pleased to see the progress that SMKA Tun Said has made and am proud of the leadership role they have taken, to actively train the teaching community in Kota Belud and Sabah to optimise the use of the Frog VLE, besides advocating for the wider use of Frog VLE and sharing best practices,” he said. During the launch event, the Minister visited the Frog Classroom where he observed a Frog Connected Classroom activity involving schools from across different states. Students from SMKA Tun Said (Sabah), SMK Majakir (Sabah), SMKA Kota Kinabalu (Sabah), SMK Serian (Sarawak), SMS Labuan and SMK Air Molek (Melaka) came together for a lesson in line with the NILAM Programme (Nadi Ilmu Amalan Membaca). A lesson to encourage reading habits among students was taught in SMKA Tun Said’s Frog Classroom and was broadcasted to the other six schools. Using various applications on the Frog VLE, including those built as feedback tools for real time classroom participation and brainstorming, students polled their opinions and discussed the lesson interactively. Through the Frog VLE, schools across Malaysia have access to a single learning platform that enables learning beyond the boundaries of a classroom. With just one click, students engage in ‘anytime, anywhere’ learning as they connect and collaborate with other schools. Through the Frog VLE, students can learn not just in school, but also at home and on the go, at any time and on any device. Students can access the Frog VLE to obtain learning and revision material with all school textbooks available online for easy revision, complete and submit homework, as well as collaborate with each other. They can also lead their own learning by self-accessing quizzes and games on FrogPlay, and access a wider range engaging and interactive learning content. Students can learn lessons at their own pace, and have fewer limitations on what they choose to study through distance-learning. For teachers, they can conduct interactive lessons beyond the borders of the classroom, design and plan lessons, and evaluate learning outcomes virtually, while parents can follow their children’s progress in school, get the latest bulletins from the Education Ministry, find out about upcoming events, and more. The Frog Classroom programme aims to transform 1,000 classrooms across Malaysia. To date, 180 classrooms have been transformed, bringing 21st century teaching and learning to 120,000 students and 950 teachers in these schools. Any school can apply to have a Frog Classroom, with selection based on a list of criteria. Interested schools as well as corporations keen to support the programme can visit www.frogclassroom.com for more information. 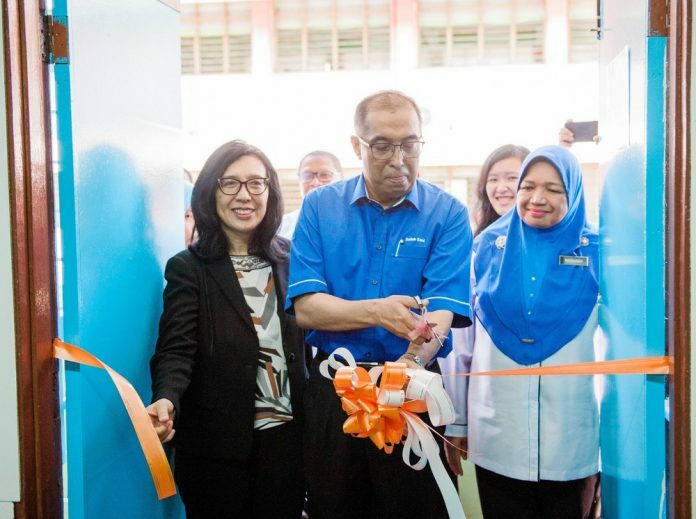 Through 1BestariNet, the Government has connected all 10,000 government schools in Malaysia to the Frog VLE with 4G Internet connectivity provided by Yes 4G. FrogAsia is the provider of the Frog VLE platform under the Ministry of Education’s 1BestariNet programme.